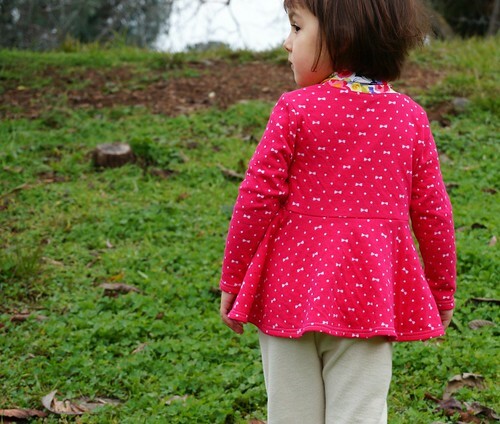 I absolutely love the classic look of a circle skirt peplum. 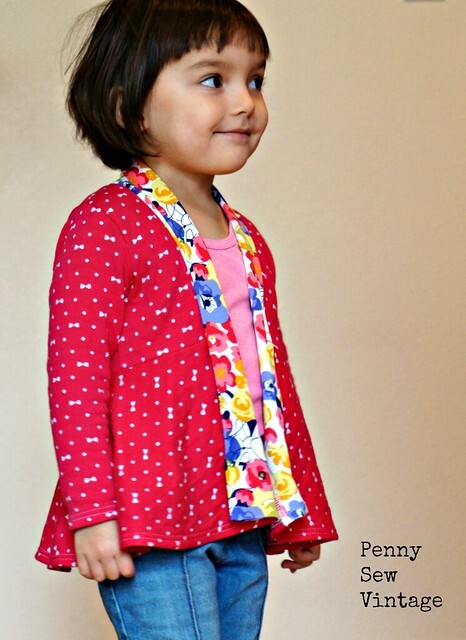 It provides just enough sophistication to make any outfit appear more than just thrown together, even for a little one, but realistically, they’re one of the easiest things to sew. 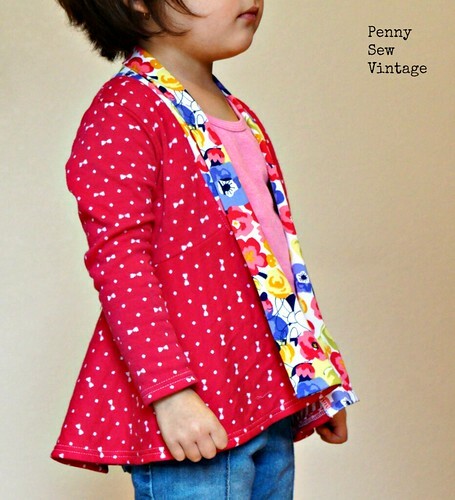 The new Fern Cardigan by Sew Like My Mom features a perfect little peplum below a fitted cardigan bodice. The front collar pulls it all together, and you can even add a bit of contrast if that’s your thing. I was able to test it in size 24 mos/2 years. 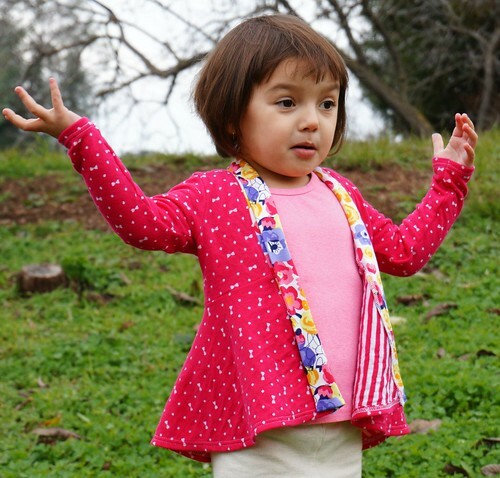 The Fern Cardigan pattern is available in sizes 12 mos – 8 years, and 6 years – 16 years. I made the long sleeve version without the belt. There are three sleeve options including short and 3/4 length sleeves. The recommended fabric is knit with at least 30% stretch such as interlock, french terry, cotton lycra/spandex, and sweater knits. I chose a double knit for the main body and a brushed poly for the collar. I was very happy with the fit, and it is supposed to be fitted. This is probably best layered over t-shirts and tank tops, or sleeveless dresses. This is the perfect cardigan for warmer winter climates like where we live. My girl liked pretending the sides were her bat wings and was just being silly, so most of our initial pics came out quite crazy! Since I used a double knit you get a little peek-a-boo when the side flips out whilst being tugged on for bat wings. I believe here she was probably saying something like, “What do you want from me mom? I’m only 3!”. Of course I’m paying her in Batman toys so you know, we’re all good. I serged most of the garment and used my coverstitch to topstitch the sleeves and hem, but you can do this with a sewing machine too. Construction is pretty quick and simple, and as always, Sew Like My Mom’s instructions are very clear and detailed. I wouldn’t recommend the brushed poly for the collar though. Since it has so much excellent recovery (great for leggings), it’s not really great for this cardigan’s collar. It just tugs up the front corners. Can you spot Minnie Mouse peeking out of the flowers though? She wore this all day, and it stayed on even without the belt. I was thinking I’d need to add maybe a snap or hook, but I’m glad I don’t. 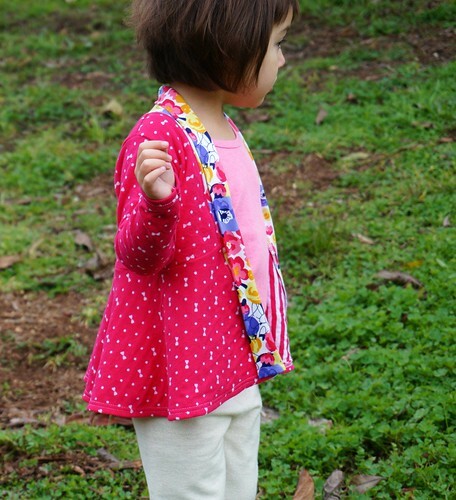 Edited to add these other lovely blogged Fern Cardigans! Anne-Mari Sews, La Casa Cactus, Replicate Then Deviate, Neva Couture, and Coralu Handmade. 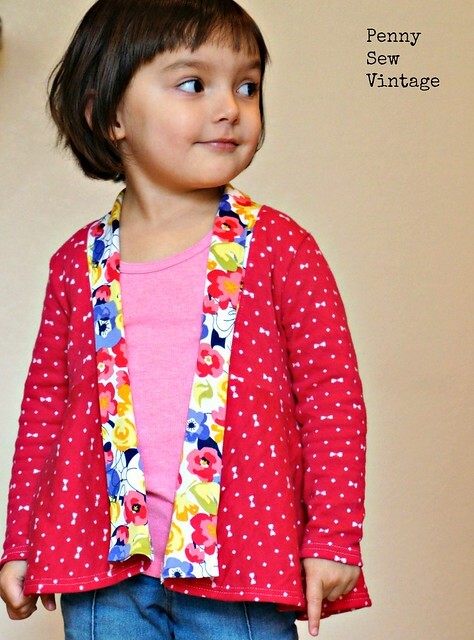 This cardi looks so great on everyone, I love it! How gorgeous! The colour is lovely and it suits your little girl so much!